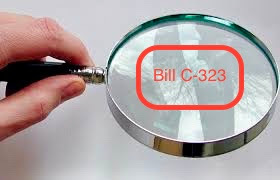 The legislation we’ve been following, private member’s Bill C-323, is headed to committee! But it’s uncertain when that will be. The Environment committee is still busy with a major review of the Canadian Environmental Protection Act. The committee is off the last two weeks of April and only has five weeks in May and early June before rising for summer break. So it may not happen until fall. In the meantime, we in the heritage community should be thinking hard about what to say to the committee — and who should say it — when they hold public hearings on the bill. There is no question that the principle of the bill deserves strong support. The principle being ... that the income tax system should be used to provide incentives for the rehabilitation of heritage property. That doesn’t mean everything in this particular legislative proposal is fine and dandy. A too-uncritical stance may not be the best course — either policy-wise or politically. Now is the time to closely scrutinize the bill’s details. One person doing just that is Paul King, a past president of Community Heritage Ontario/Patrimoine Communitaire de l’Ontario and a member of the CHO/PCO board. Until recently Paul was a partner in the law firm Fasken Martineau. In the current issue of CHOnews, Paul talks about what is in the bill (and what is not). He cites and comments on the issues raised during the Second Reading debate by government MPs, particularly Ginette Petitpas Taylor, Parliamentary Secretary to the Minister of Finance. Tax changes should ideally be made as part of the budgetary process so that all options are examined and a balance is struck between priorities. It is critical that new fiscal commitments are only made when they are affordable and the government can do so responsibly. The Bill does not cap the amount property owners can apply for and obtain. There is a concern that this Bill will not be a benefit for the "middle class”. The Income Tax Act already contains incentives to encourage donations for the preservation of historic assets. Some property owners will be eligible for the rehabilitation tax credit while their neighbours, who do not own a designated historic property, would not be eligible. The tax credit is just providing an unexpected perk to owners for doing work that they are already obligated to do. The government will have to assess whether Parks Canada has the resources to meet the anticipated increased applications for historic designation and whether the Canada Revenue Agency is equipped to handle the added administrative burden. Concluding that "some of these concerns have merit and deserve attention" at committee and that "[others] are dubious," Paul goes on to raise a number of other questions about the bill. What other concerns about this Bill need to be reviewed by the House Standing Committee on Environment and Sustainable Development? Should there be a clawback of the tax credit or capital cost allowance or perhaps some other mechanism to deal with rehabilitation work that is later undone by neglect, alteration or demolition? Under some provincial legislation, demolition of designated heritage structures is controlled but this does not apply to national historic sites unless they are provincially designated. Definitions need to be clarified perhaps by adding details in regulations. For example, rehabilitation expenses do not include costs incurred solely for aesthetic or cosmetic purposes. What does this mean? Some key heritage ornamentation (such as brackets under eaves, carved gingerbread on gables, or roof cresting) were never functional and solely installed for aesthetic purposes. Is painting with heritage colours or wallpapering in heritage patterns solely for cosmetic purposes? Exterior shutters were once functional but are now solely aesthetic, so can the rehabilitation or replacement of shutters be included as a rehabilitation expense? Is there a way to include heritage properties in heritage conservation districts without also including properties with no heritage attributes? This issue may already be addressed indirectly in the Bill because any rehabilitation must be carried out in accordance with conservation standards (being the standards and guidelines for the conservation of historic places in Canada adopted and applied by the Parks Canada Agency). Also, any rehabilitation work must be certified by a professional architect confirming that the work was carried out in accordance with conservation standards. Is it a good idea to leave the judgement call on eligible work to architects? This may be both too broad and too narrow because most architects are not heritage experts. Perhaps “professional heritage consultants” would be better. This would include heritage architects but also other heritage experts with appropriate qualifications and experience. To these questions and concerns, which I share, here is one more. It also greatly increases the number of potentially eligible properties, not necessarily a good thing in the eyes of a government clearly concerned about how wide a net is being cast and the implications in terms of costs and administrative burden. Don’t get me wrong. I am the first to agree that we need better, broad-based incentives for the preservation of designated properties. But by making this bill a vehicle for achieving that, do we risk losing the whole shebang? What do you think about the finer points of the bill? Have a closer look here. Note 1: From “Bill 323: An Act to Amend the Income Tax Act”, CHOnews, Spring 2017, pp. 1-3. The excerpts here are used with Paul’s permission. Note 2: For more on CHIPIF see OHA+M from December 21, 2016. Note 3: This is because, as the American experience proves, the return over time on the investment the tax credits stimulate result in increased (taxable!) business income.